In the late eighteenth century, France was going through the Age of Enlightenment, an intellectual movement that considered reason as the only instrument for individual and social progress. Through the light of reason, humanity could dispel the darkness of ignorance, superstition and tyranny. It hoped to build a better world. The art at the time was also extremely rational: the technique of the artists was impeccable; their details, exquisite; the composition was studied obsessively. In short, art was less than perfect. This type of style is called “neoclassicism” because it intended to do a reinterpretation of ancient Greek and Roman art. The main artist from this movement in France were Jacques-Louis David, and his student Jean-Auguste-Dominique Ingres. The young Delacroix also began to paint under this paradigm but began to distance himself when he first saw “The raft of the Medusa” by Theodore Gericault. From there, Delacroix began to find the inspiration from Renaissance paintings, and not from the classical art. Delacroix starts to emphasize color and movement for his paintings, and not the perfection of the line anymore. Liberty leading the people is one of the world’s best known paintings. We see it everywhere; from commercials to pop albums (e.g “Viva La Vida” by Coldplay). It also inspired the creator of the Statue of Liberty, which was given to the U.S. by the French 50 years after Delacroix painting was finished. For art, it represents the shift from French neoclassicism to romanticism. The work commemorates the July Revolution of 1830, which consisted of three days of clashes between civilians and the royal army of Charles X of France. The monarch had become despotic and autocratic, and plunged the people into a state of chaos and despair. Hunger, unemployment and mismanagement caused a popular uprising in which all classes participated. In the painting, in the foreground we see a female figure representing Liberty. I think it’s obvious but, just in case, we should clarify: the painting is not based on actual events. Freedom is only an allegorical figure. It would be quite unlikely for a half-naked barefoot woman to lead an armed uprising. 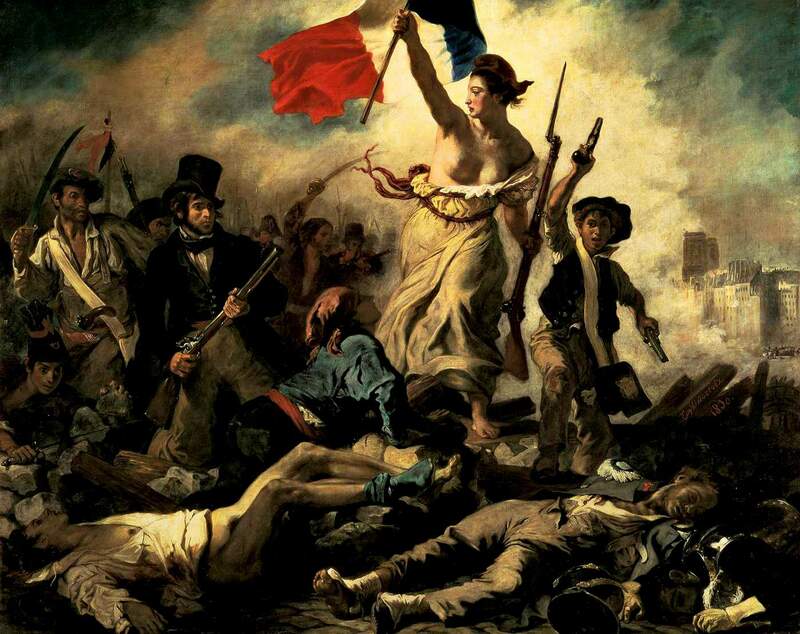 Holding the French tricolor, she leads the revolutionary under the banner of “liberty, equality and fraternity”, while marching on top of dead soldiers from the royal army. Behind her we see the different social classes who joined the revolution: the character with the top hay represents the Parisian bourgeoisie as the young with guns represents the working class. It’s a dramatic and crude scene, in which we see the horrors of battle at the same time that it shows us the seed of a new France, free of despots. With the uprising, Charles X was replaced by Louis-Philippe, who was a more just and fair king. The throne of France was never considered a hereditary or divine right anymore: after the revolution, the king began to be elected by the people. ~ by Álvaro Mazzino on February 3, 2012. Just a small correction, the “Age of enlightenment” was the late 18th century, not 17th Century. 17th Century was the 1600s, and Louis XIV reigned. Voltaire was mid-latter 1700s. Thank you, Sam. My bad. I’m correcting it right now! There is little consensus among scholars on the precise beginning or end of the “Age of Enlightenment”. However, “the small correction” above is a large error. The suggestion that “the “Age of Enlightenment” was the late 18th century” is incorrect. The middle of the 17th century (1650) is often used as an approximate starting point. If taken back to the mid-17th century, the Enlightenment would trace its origins to Descartes’ Discourse on Method published in 1637. Others define the Enlightenment as beginning in Britain’s Glorious Revolution of 1688 or with the publication of Newton’s Principia Mathematica in 1687. A timeline of the most influential works published but the key thinkers of the Enlightenment show they were nearly all published well before the “end of the 18th century” and most in the late 17th century to mid 18th century. Of the list below all of these great thinkers were dead before 1790 except for two; Beccaria and Smith. More importantly their influence was in the late 17th century to mid late18th century and NOT “the end of the 18th century” full stop. As to the end of the “Age of Enlightenment” I think John M. Merriman, a Charles Seymour Professor of History at Yale University, says it best; 1789  Why? That is when its two arch enemies died, Voltaire and Rousseau (Voltaire, François-Marie Arouet 1694 – 1778, Rousseau, Jean-Jacques 1712 -1778)  However, some scholars do choose to use the last years of the century – but still choosing the year 1789 but for different reasons; this was the beginning of the French Revolution of 1789 and a few scholars choose the beginning of the Napoleonic Wars (1804 – 1815) as a convenient point in time with which to date the end of the Enlightenment. Many thanks for another excellent write-up. Exactly where otherwise could any one wardrobe style of details ordinary fantastic way with words? I have a display up coming 7 days, using this program . to the find similarly info. Other brands usually just create their own style of chains rather than a copy of the reissue. So it depends on whether you want the chain to be as rare on the street as it can get or as recognizable as the logo itself. In testing the new camera features of iPhone 6s and 6s Plus compared to last year’s 6 and 6 Plus, there wasn’t always an obvious, incredible jump in image quality, as is ostensibly suggested by the “50 percent increase in pixels” of the new models’ 12MP sensor compared to the previous 8MP shooter. This entry was posted on February 3, 2012 at 15:08 and is filed under Romanticism.You can follow any responses to this entry through the RSS 2.0 feed.You can leave a response, or trackback from your own site.